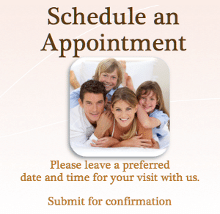 We are delighted that you have chosen our office for your dental needs. Our patients are our most important asset, and we strive to develop long-lasting, trusting relationships with all of our patients. Your initial exam will take about an hour unless you have an immediate dental problem that needs attention. During this visit we will take digital x-rays and conduct a thorough health evaluation. We will schedule your prophy after your initial exam and this can be done on the same day if time allows. We have made our new patient forms available to you as Adobe Acrobat files. For your convenience, we recommend printing and completing these forms at home. Please remember to bring your completed forms with you for your first appointment. If you have any problems getting these files to print properly, please call our office and we will gladly mail or fax them to you.